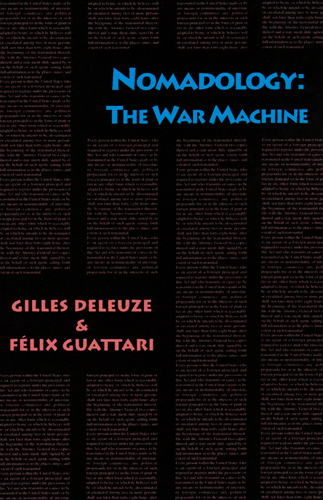 In this daring essay inspired by Nietzsche, Gilles Deleuze and Felix Guattari redefine the relation between the state and its war machine. Far from being a part of the state, warriers (the army) are nomads who always come from the outside and keep threatening the authority of the state. In the same vein, nomadic science keeps infiltrating royal science, undermining its axioms and principles.Nomadology is a speedy, pocket-sized treatise that refuses to be pinned down. Theorizing a dynamic relationship between sedentary power and "schizophrenic lines of flight," this volume is meant to be read in transit, smuggled into urban nightclubs, offices, and subways. Deleuze and Guattari propose a creative and resistant ethics of becoming-imperceptible, strategizing a continuous invention of weapons on the run. An anarchic bricolage of ideas uprooted from anthropology, aesthetics, history, and military strategy, Nomadology carries out Deleuze's desire to "leave philosophy, but to leave it as a philosopher."